Maybe you're moving house, and the timing's not quite right, or you need to clean out the spare room so family can stay. Travelling overseas and sold your house? Whatever your storage needs, Easystore can help. From weekly to long term storage we have the solution for you. We have space to store just a few boxes, your boat, or a whole houselot. We have 45 storage units, a motorised goods lift and alarm system, with 24 hour access and the ability for trucks to back right inside, out of the weather and unload directly into your very own storage unit. All you require to move in is your own padlock and 1 months rental in advance...it's as easy as that. 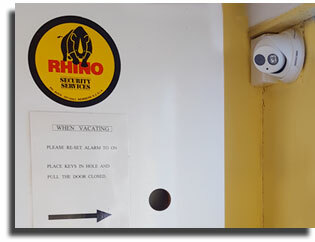 Easy Store has monitored, recorded surveillance cameras operating 24 hours. "I'm very happy with the facility and service. Great access also and security brillant." "I highly recommend the facilities at Easy Store. Having storage units that you can drive into without getting wet and with 24/7 access when unloading or loading is the best. The rates are extremely competitive and the service is fantastic." "Thank you very much for the use of the Unit. It has been great. If I every need storage in future I will get back to you or tell friends if they are looking for storage. Being able to drive in and unload and load in a dry secure site was brilliant"